- Publisher The songs in this collection are melodic but simple enough for any child to pick up. Themes range from outdoor play, to dreaming of magic ponies, to celebrating birthdays. The lyrics draw on the work of such classic poets as Christina Rossetti and Hans Christian Andersen, as well as on folk traditions from around the globe. Each song is presented with piano accompaniment and guitar chords. A sing-along CD is included. - Publisher This collection of 80 children's songs from America & around the world is accompanied by a CD of 56 of the songs. 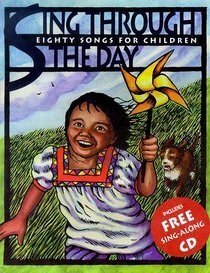 About "Sing Through the Day (Includes Free Cd)"
The songs in this collection are melodic but simple enough for any child to pick up. Themes range from outdoor play, to dreaming of magic ponies, to celebrating birthdays. The lyrics draw on the work of such classic poets as Christina Rossetti and Hans Christian Andersen, as well as on folk traditions from around the globe. Each song is presented with piano accompaniment and guitar chords. A sing-along CD is included. This collection of 80 children's songs from America & around the world is accompanied by a CD of 56 of the songs.